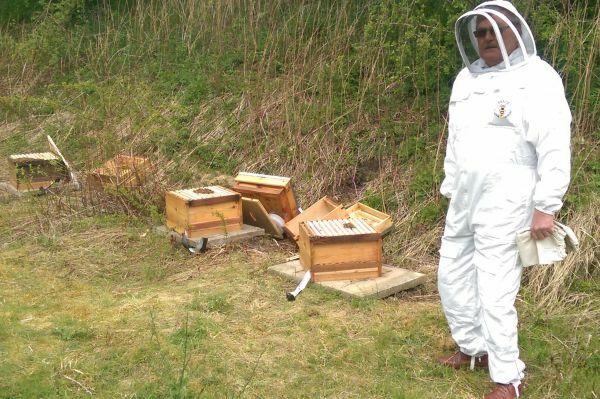 POLICE are hunting vandals who wrecked community beehives costing thousands of pounds just hours after they were installed, and a reward of £5,000 has been offered by one local resident for information leading to the arrest and conviction of those responsible. Thousands of Buckfast bees, named after the monks’ abbey where the famous tonic wine is made, died in the wrecking spree near an old railway line outside Stonehouse in Lanarkshire. Residents have now rebuilt the hives and hidden them at secret locations. The Avondale Community Beekeepers, a £10,000 National Lottery project set up by the 30-strong group, put up the hives, which were made by pupils at Strathaven Academy in Lanarkshire. Some 60,000 bees were then put inside with their queens. Within hours the hives were smashed up and 3,000 bees were lost despite a desperate bid by local man Danny Baxter to save the bees by scooping them up and putting them back into the hives with his bare hands. Police Scotland confirmed they had been called to the incident and inquiries into the vandalism are continuing. Father-of-five and grandfather David Paterson, 56, from Strathaven, came up with the idea of having his own beehive in his garden. However, when his neighbours heard about it and they wanted to become involved. Paterson and the rest of the group applied for funding and won £10,000 from the National Lottery, £800 from South Lanarkshire Council, Strathaven Round Table £250 and a donation from wind farm firm Banks Group. He said: “About 18 months ago I came up with the idea to have a beehive in my garden because I’ve always fancied having bees, but it spread around the community and before I knew it we had about 30 local people interested in setting up a community keepers’ group. “We share 20 beehives on eight different sites and everybody takes it in turn to look after them. We had 60,000 bees which cost us about £3,000. They only went in on Thursday night and within hours they were vandalised. We were gutted. “The hives had been sitting there empty for three weeks untouched before we put the bees in. We only found out they had been vandalised when one of the volunteers went down to check on them on Friday afternoon and he called the police. The community beehive group has rallied round to help put the beehives back together and relocate them at secret sites. The group is determined not to let the vandals ruin their project or their fun and they are calling for ideas for songs related to bees to keep them upbeat. So far volunteers have come up with a playlist including: Staying Alive by the Bee Gees, Let it Be by the Beatles and Sugar Sugar from the Bee Movie.